The Spectrum Scope Monitor (SSM) is a very handy feature of the FT-817 allowing you to monitor a quiet band and see when signals pop up outside the receiver passband. There are a couple of things not explained in the manual that make SSM more valuable as an operating aid. If you look at the region of the display just under the frequency you'll see 11 segments. Each segment can rise and fall according to the received signal strength on that frequency. The center segment represents the frequency on the display and there are 5 segments below and five segments above. The value of each segment is controlled by Menu Item 47 "SSB Step", when set to 1 kHz each spectrum display segment represents 1 kHz so you are monitoring 10 kHz of spectrum. At a 2.5 kHz you can see a 25 kHz slice of the band (12.5 each side of the center frequency) and when Menu 47 is set to 5.0 kHz you'll see a 50 kHz chunk of RF. SSM can run in either a continuous sweep or in check mode that performs a sweep every 10 seconds, this is controlled by Menu Item 43 "Scope". While SSM is running if s signal pops up just turn the main tuning knob to bring that signal to the center of the display then turn off SSM by pushing in the Select knob. You should now hear the signal. This procedure is a little more difficult in check mode since it must be accomplished in 10 second iterations. I find that when monitoring CW signals with 1 kHz steps, if the narrow filter is installed, turning it on improves the operation greatly. If you're listening to a 25 or 50 kHz section of band, turn the narrow filters off so there is a little bit of overlap between scan steps. If you found this tip useful, please leave a comment. Cadsoft publishes a very powerful schematic capture / circuit board layout program called EAGLE, that is free for hobbyist / non-profit use. I spent a couple of hours working through a wonderful free tutorial available on Sparkfun's website and it definitely helped flatten the learning curve. The picture at left is my finished circuit board design, all ready to be e-mailed to a fab house for production. 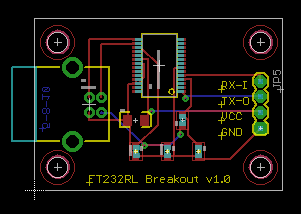 The example board is a USB to RS-232 serial converter using an FTDI FT232RL chip. The LVB Tracker that I use for automatic control of my satellite antennas has an existing RS-232 serial port but is not configured to use USB. I'm having difficulty locating the USB daughter board that G6LVB used in his design so this board should allow me to homebrew a replacement. I especially like that the tutorial example uses an FTDI device, they seem to be the most trouble free adapters for use on a Macintosh. The Steampunk genre in literature is the juxtaposition of Victorian Era technologies with modern science fiction themes and I believe that transmitting Morse Code signals through a low earth orbiting satellite qualifies. 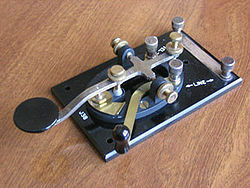 Morse code, or more properly Vail code (Morse's system was strictly numeric, Vail added letters and punctuation) was developed in 1836; the International Morse Code used in radio communications dates from around 1865. Science Fiction author Arthur C. Clarke is widely credited with inventing the concept of the communications satellite in 1945, arguably our modern society's infrastructure could not exist without them. In 1961 a group of radio amateurs known as Project OSCAR (Orbital Satellite Carrying Amateur Radio) built a satellite that was launched as a secondary payload from an Air Force rocket. OSCAR 1 only had a transmitter (vs. a transponder which receives signals from the ground and re-transmits them) and the signaling method was...you guessed it, Morse code. There have been over 70 amateur radio satellites built and launched and the currently operational fleet numbers around 24 spacecraft. Not every satellite has the ability to receive and re-transmit CW (continuous wave, which is the modulation method; Morse code is the signaling scheme) but a majority use it for either primary or secondary telemetry transmissions. Aside from spectral and power efficiency my great passion for CW stems from the fact it is a skill that must be acquired and honed, not something that can be bought. A large number of the population can "drive" a power boat, it takes a skillful seaman to sail a sailboat. As a child of the space age I recall spending the entire duration of the Apollo 11 mission parked on the couch in my parent's family room, in front of the television, watching events unfold in realtime. 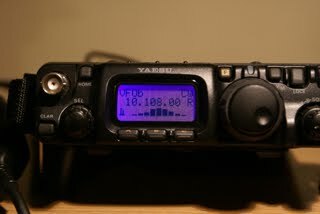 The technical challenge of assembling an amateur radio station capable of space communications coupled with the skill required to copy relatively weak, doppler shifting signals is one of my passions in amateur radio.